Pics & Pieces: I won this! 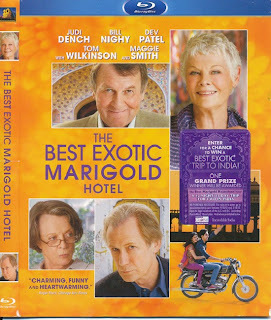 Back in September, Gill at That British woman was giving the Blu-ray disc of The Best Exotic Marigold Hotel and I won!!!! When I saw that it had Judi Dench in it, I immediately wanted to see it, but didn't get the chance to set down and watch it till the past two days. It is not anything I will watch again, but yet I don't regret watching it at all. Its setting was India and I loved seeing it..even if it was just the market and city streets, etc. That is all interesting to me. The characters all came to India for one reason or another, to stay at this hotel advertised as luxurious...but luxurious it was not. The characters were all retirees...Maggie Smith (Muriel) came to have an operation, Judi Dench's(Evelyn) husband and just died and everything had to be sold to pay off the debts, and the others came for various reasons. It sure made me wonder how I would react to be set down in some country where all was foreign to me. I wonder if I would be as adaptable as some. And if I had not already been thinking about the aging process, this would have made me think about it. I don't know if that is good or bad. If I were rating this on a scale of 1 to 5, I would probably give it a 3.8....mot quite a 4 but almost. I am glad to see your review. I just added it to my Netflix queue earlier today. I'm a big fan of Judi Dench, too. i am way far along in the aging process, and i do Not Like It. at all. Sounds like an interesting story. Culture shock seems to go along with a person's first visit to a very different country. I'm not sure how I would react to suddenly finding myself in a different culture either. I bet thee learning curve would be steep! Sounds like a thought-provoking disc... Glad you enjoyed it, Rose. I wanted to see this when it was in the theater but never got to it. Now I hope to find it at the library. I really do want to see it. The cast looked very good.